This tutorial will be showing you how to install and use rss2email on Ubuntu 18.04. Rss2email is an open-source program that can send RSS feed update to your email address. RSS feed is great way to keep updated with blogs and websites, but some site owners allow certain amount of articles in the RSS feed and others set a time limit. RSS feed readers don’t save articles on your computer, so you will miss some articles from time to time. Wouldn’t it be nice if you can store all articles in a mailbox so you never miss a blog post? That’s where rss2email comes in. 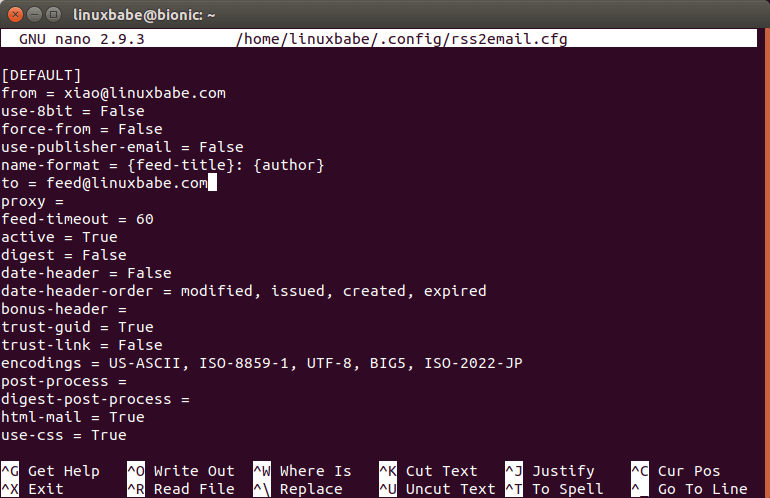 Rss2email is in the default Ubuntu software repository, so you can easily install it by executing the following command in a terminal window. The binary will be installed as /usr/bin/r2e. Once installed, you need to create a new feed database with the command below, which will set a default email address that mails are sent to. It’s recommended that you use a dedicated email address for your RSS feeds. Next, you can export your RSS feed subscriptions from your feed reader to an OPML file and import it to r2e feed database. Some web-based feed reader may give you an XML file. You can also import it too. Now you can edit the configuration file. I will use the Nano command line text editor. The default from address is [email protected], you probably want to change that. Next, you need to add a target email address. If you want to receive email in HTML format, then change the following values to True. Update: By default, rss2email will use the email address found in the feed as the from address (when there’s an email address in the feed). This causes bounced email sent to the email address in the feed, effectively creating the backscatter problem. To disable this behavior, use force-from = True. Save and close this file. To save a file in Nano text editor, press Ctrl+O, then press Enter to confirm. To close the file, press Ctrl+X. Then we need to configure how rss2email sends email. By default, r2e uses sendmail binary to send email if it exists on the system. If you installed rss2email on your Postfix mail server, then you can skip this part. If you installed rss2email on your local computer, then you can use SMTP to send email. Although rss2email allows you to configure SMTP in ~/.config/rss2mail.cfg file, the implementation is quite buggy actually. Instead, we can use sSMTP to configure SMTP. sSMTP is very simple SMTP server. First, install ssmtp on Ubuntu 18.04. Then open the configuration file. Edit the file like below. Note that if you enabled two-step verification for your Gmail account, you will need to use an App password instead of the normal password. I use Gmail SMTP server for r2e to send email in this example. You can use other email services as well. Save and close the file. Now you can run the following command to test the SMTP configurations. If SMTP configurations are correct, you will receive an email from your Gmail account. If you see this following error while running the above command. 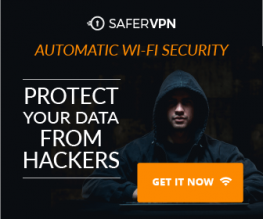 It’s because your SMTP server doesn’t support the LOGIN authentication mechanism. Postfix is a full-blown and very popular SMTP server. You can use Postfix to relay email through Gmail instead of using sSMTP. If you installed sSMTP before, remove it. 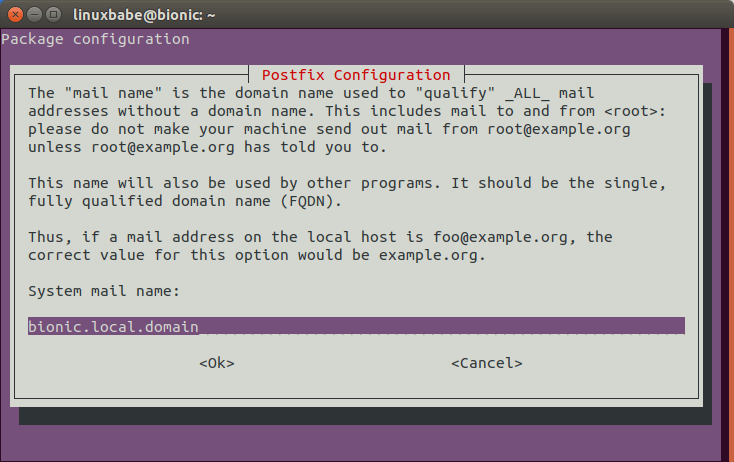 Then install Postfix on Ubuntu 18.04. When you see the following message, press the Tab key and press Enter. Then choose the third option: Internet with smarthost, because we want Postfix to send email via another SMTP server such as Gmail. Next, set the system mail name. I just use the default value because it doesn’t matter. Finally, enter the SMTP server address. If you use Gmail, enter smtp.gmail.com:587. After Postfix is installed, open the configuration file. Add the following lines to the end of this file. Save and close the file. Then restart Postfix for the changes to take effect. Now you can run the following command to test the SMTP configurations. After SMTP is configured, you can poll all your feeds by running the following commands. This command is run only once because rss2email will poll all articles in the feed database. You probably don’t want to receive articles you have already read, hence the --no-send option. If you have a lot of feeds in the database, then this process can take some time. After this command completes its task, you need to run the following command to receive new articles from your RSS feeds. Instead of manually executing r2e run every time, you can use Cron to automate this task. Open your crontab file. Put the following line into this file. This will run r2e every 20 minutes. To run r2e every 30 minutes, just change 20 to 30. Google Chrome stopped supporting RSS feed a long time ago. Some sites doesn’t show their RSS feed URL to visitors. You can press Ctrl + I in Firefox to find them. I hope this tutorial helped you install and use rss2email on Ubuntu 18.04. Take care.